Providing IT support in the DC Metro area, we frequently offer advice on how to prevent every business owner’s worst nightmare: being forced to suspend their operations because of a natural disaster, cyberattack, equipment malfunction, or some other disruptive event. Making this situation even worse is thinking about the loss of or damage to important files, databases, and records, which would severely impact any business. Critical data can also be lost by simple human error such as the accidental deletion of files. Fortunately, there are some basic steps that your company can follow to ensure that your business is always operational and that you never lose critical data. Conduct a business impact analysis to identify time-sensitive or critical business functions and processes and the accompanying resources that support them. 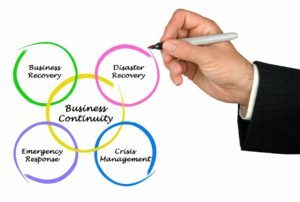 Develop and Implement a comprehensive business continuity plan that best suits your company’s unique operations. Train all employees to follow policies and procedures in business continuity plan to reduce human error as much as possible. Conduct testing and exercises to evaluate your employees and your business continuity and recovery plan. Maintain and update company hardware, software, and anti-virus protection. Employ an effective Backup system to protect and preserve your data. The key to business continuity and data recovery is having a robust and effective backup system for your company operations. To achieve this objective, your company can utilize one of the following backup systems described below. Onsite or local backups means having a backup system where the physical piece of backup hardware is stored at your office location. The hardware may be located with your servers or in a separate office at your location. Because the hardware is stored at your office, your company (and/or your IT support professionals) are responsible for managing and maintaining the equipment. This maintenance includes careful attention to keeping it clean and making sure it is stored in a climate-controlled environment so that the equipment will function properly and operate as long as possible. Offsite or Cloud backups refers to a backup system where the physical piece of backup hardware is not stored at your office location. The hardware is instead hosted somewhere else, usually at a data center. With this method, the company who runs the data center is responsible for managing and maintaining the physical equipment. The Hybrid backup system is a combination of both Onsite and Offsite backups. Your company has a physical piece of hardware for backup in your office, but you also have a backup system offsite at a third-party managed data center. Network Deport recommends this system for many companies because it provides an extra level of redundancy. For example, if something terrible happens at your office-a power outage, a hard drive crashes, or a natural disaster such as a flood or fire- and all of your equipment is down or destroyed, you can rest easy since your data is still safe within the offsite backups. A critical component of your company’s business continuity and data recovery solution is the ability to not only backup data, but to be able to ensure that this backed-up data is uncorrupted. In order to accomplish this, your company or IT partner must have a dedicated resource running daily integrity checks on your backup system. Many companies make the mistakes of not regularly checking their backups (known as “setting and forgetting”) or using backup solutions that are more suitable for individual use rather than for businesses such as MozyPro or Carbonite. The problem that frequently occurs is that while all data is being backed-up, there are inevitably some files which become corrupted in the process. Without daily integrity checks, there is no way to know if your data is being backed-up properly and, thus, capable of being fully recovered in the event of a disruption. To illustrate this point, Network Depot has a full-time resource whose only job is to run daily integrity checks for our clients. He responds frequently to alerts, many of which are false alarms, but a substantial amount represent corrupted data, which has not been backed-up properly. In those situations, his task is to correct any issues in the back-up process so that all the data backed up maintains its integrity. A back-up solution only works properly when a trained resource is performing daily integrity checks on the data stored in the system. For assistance in making sure your company’s data is backed-up and recoverable and your business can stay operational, please contact Network Depot.